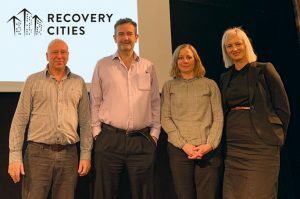 The inclusive cities model is a forward thinking-approach to boosting people’s recovery in the communities where they live, say Professor David Best, Professor Charlotte Colman and Stuart Green. How does recovery happen? Research shows that people overcome addictions and recover through a combination of three factors. The first is personal factors such as maturation and personal motivation, the second is social factors like support from family and friends, and the third is community factors such as effective reintegration. This shows that recovery is not just an issue of personal motivation, but is also about acceptance – by family, friends and a range of organisations and professionals across the community. (left to right): Stuart Green, service manager, Aspire Drug and Alcohol Service; Professor David Best, Sheffield Hallam University; Linda Nilsson, City of Gothenburg development manager; and Mulka Nisic, Recovered Users Network (RUN). In the beginning, research and practice mainly focused on understanding personal and social factors in recovery. But today we know that what is equally, or even more, important is one’s relationship with the community – recovery doesn’t happen in a vacuum. Therefore to support pathways to recovery, structural and contextual efforts are needed to supplement individually oriented interventions and programmes. (Re)building one’s relationship with the community is, however, a difficult journey. While the community could be central to recovery by building and strengthening bridges between members, it could also act as a barrier. People who struggle with addiction – even those in recovery – experience exclusion, stigma and discrimination, such as employers not offering them a job, landlords who discriminate against them, or neighbours who ignore them. Such a community has negative consequences for sustaining the recovery of its citizens. It’s against this backdrop of exclusion, stigma and discrimination at a community level that the drive for ‘inclusive cities’ arises. An inclusive city promotes participation, inclusion, and full and equal citizenship to all its citizens, including those in recovery. The first purpose is to build and promote inclusive cities for people who are in recovery from illicit drug and alcohol use, while the larger aim is to challenge exclusion and stigma through a championed model of reintegration for other excluded and vulnerable populations. This can be done by channelling peer successes, and building on innovation and existing connections. The central idea of an inclusive city is that no one should walk the recovery path alone. In an inclusive city, the city council, private and public organisations, housing providers, welfare and health centres, employers, and neighbours commit to working together with people in recovery to support them in their recovery process. By focusing on social connection, an inclusive city aims to challenge exclusion, and by doing so reduce stigmatisation. A strong example of social cohesion is the Northern Recovery College, where collective learnt, lived and worked experience based on ‘everyone has something to give’ comes together to share experiences of individual strength-based or community assets. There are countless examples of initiatives that fit within the idea of inclusive cities – they could be small steps involving limited budgets, or more structural steps such as establishing a social enterprise model. One of the aims of an inclusive city is to celebrate recovery and to create a safe environment supportive to recovery. After all, celebrations involve rituals, fostering social bonding and strengthening solidarity and social cohesion by bringing people together. But although we celebrate a lot of events in our lives, we don’t tend to celebrate successful recovery journeys. One of the first steps to celebrate recovery, therefore, is to make recovery visible. Activities such as recovery marches, recovery games, recovery bike rides and recovery cafes have been an attempt to create a visibility around recovery, as well as to create a common bond and to challenge exclusion and stigmatisation. Equally important are visible and strong representations in local and mainstream media, to create a balanced view of recovery and wellbeing and demonstrate visible community benefits. Another aim is to focus on peer and community support and cohesion. Setting up a recovery café – such as the Serenity Café in Edinburgh, or Nottingham’s Café Sobar – could be a way to foster this. A recovery café is a social place where people can support each other in their recovery journey. Because the café aims to promote social integration and broaden social networks, it is open to everyone – people in recovery, volunteers and the general public. Activities such as social and hobby groups, recovery-support groups and training programmes to become recovery coaches are also regularly organised. An inclusive city also has a focus on meaningful life and social roles, such as access to meaningful jobs. A city could therefore work together with employers to foster certain skills, promote apprenticeships and create access to worthwhile employment, and inspiration for setting up such an initiative can be found in Blackpool’s Jobs, Friends and Houses project. So, how do you become an inclusive city? It’s a process that takes time, and even small steps – mostly focusing on making recovery visible in the community by raising public awareness – are steps in the right direction. The role of the community could include the provision of mutual aid, peer support and educational campaigns, establishing inter-sectoral partnerships to promote social inclusion, carrying out activities and setting up structures to change attitudes and reduce stigma, providing incentives for employers to employ people in recovery, and implementing anti-discrimination policy. Our initiative is an indication that there is a growing momentum that we are tapping into and bringing together from its disparate roots. Of course, no plan for inclusive cities can have any chance of acceptance and implementation without a positive mind-set and the buy-in of key stakeholders involved in local government and local community connectors – the ‘go-to people’ who live there. So the first step is bringing together key people from organisations responsible for employment, housing and social welfare in each city to make an overview of existing practices (community asset mapping), as well as to identify current gaps. They will also define the city’s mission, vision statement and related – short-term as well as long-term – goals and actions to support recovery, in line with the available resources and the people’s needs. People in recovery, as well as their families, will be included in defining these actions, leading to services being tailored to their needs. The second step is implementing the identified actions, while monitoring and evaluating the process. Beginning the process of recruiting community connectors at the Recovery Cities event in Gothenburg, Sweden. 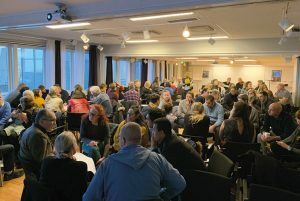 A recent recovery cities event in Sweden hosted by the City of Gothenburg began a process of recruiting community connectors, key citizens and early adopters to support this process in the local delivery of well-connected recovery communities. Inclusive cities was also presented at a ‘recovery cities’ side event at the recent Commission on Narcotics Drugs (CND) in Austria. The event highlighted the advantages of joint cooperation and partnerships, with the CND seeing more than 2,400 participants from 140 countries. By building a learning set of cities across Europe, the idea of inclusive cities can be implemented and tested in practice. When several cities engage with the idea of inclusive cities, ingredients and – hopefully – good practices to improve social justice and community engagement can be shared. David Best is professor of criminology at Sheffield Hallam University. Charlotte Colman is professor in drug policy and criminal policy at Ghent University.